For those of you looking to attend sponsored off-roading events, a lot of the equipment requirements will depend on who’s hosting the event. Most sanctioned off-roading events will have a list of items that must be present in or on the vehicle, prior to participation. In fact, it’s not uncommon in the larger events for your vehicle to go through a complete inspection before the event begins. Typical checklist items are usually aimed at vehicle and passenger safety and include things like working headlights, wipers, and brakes. Again, many of these requirements come down to the event type and sponsors. Since I planned to attend a variety of different events, as well as long-distance travel, I decided it would be best to be on the safe side and cover as many of the potential requirements as possible. Because my vehicle is relatively new and in good working condition, I didn’t really have to worry much about things like headlamps and brakes. Where I came up short was in the departments of add-on safety and recovery gear as well as some of the more general tools and supplies. So I expanded my focus from preparing for a single, local event, to preparing for a more extensive overland adventure, a trip where the conditions were less controlled. Based on some event requirements, and as a general rule of thumb, it is highly recommended that each vehicle carry a fire extinguisher and first-aid kit in case of an emergency. Most people do not consider an on-board fire extinguisher to be a necessity. Statistically, the odds of needing one are low. But I’d much rather have one and not use it, than need one and not have it. So this particular purchase made good common sense. I don’t want to go into the various types of fire extinguishers at the moment since that would entail a great deal more detail. But I highly suggest doing your research before making a final decision on which type to purchase. Regardless of the type you choose though, for vehicle safety reasons, it’s highly recommended that you purchase a five pound unit at a minimum. Smaller units simply don’t last long enough to do much good. In addition to the size requirement, my particular research indicated that certain types of extinguishing agents can be very corrosive, resulting in a lot of damage to vehicle components. Dry chemical agents will not harm components but they do tend to be extremely messy and difficult to clean up after the fact. Halon extinguishers are both expensive and reportedly much more dangerous to passengers in an enclosed space. There were a lot more recommendations to consider but after all my research, I ended up purchasing a HalGuard five pound extinguisher through Summit Racing. The Halguard units use an agent that is non-corrosive and very easy to clean after the fact so it seemed like the best compromise to me. The five pound units were also large enough to be useful yet still small enough to mount nicely on the Springtail Solutions side rack in the rear cargo area. So that covers the two primary safety items in the list. But there are quite a few additional odds and ends that I decided to add as well, just to round out the equipment load a bit more. If you haven’t taken the time to get to know your vehicle’s electrical system, I suggest doing so. Knowing the basics of how your vehicle operates is one of the first steps to being better prepared. At a minimum, you should investigate any and all fuse panels throughout the vehicle. With the amount of electrical components in today’s vehicles, a blown fuse can cause a myriad of problems. This is easily cured however, if you carry an extra supply of fuses on board. By inspecting your various fuse panels, you’ll know which type and size of fuses to purchase for your spare fuse kit. I managed to find some decent prepackaged fuse kits that contained a good selection of fuses ranging from 3 amps to 30 amps, which covers most of the basic electrical components of a vehicle. I also highly recommend carrying a set of 10-20 foot jumper cables in your vehicle at all times. You never know when an unexpected electrical short might leave you high and dry somewhere. In the event that you end up disabled in the darkness, having an operational flashlight stowed away can make a big difference. Even in daylight, peering under the dash, within the engine compartment or under the vehicle itself can be difficult without the assistance of some sort of lighting. I purchased a Maglite brand flashlight over ten years ago that still works great. But just about any type will do. A popular option these days is to purchase an LED flashlight since they’re typically brighter and use less energy. A disabled vehicle will usually mean a non-moving vehicle. If you get caught in a high-traffic area, this can be quite dangerous, especially if visibility is reduced by weather or darkness. There are two common solutions to this problem. The first option is to purchase road flares. These often come in packs of two or three and are relatively inexpensive. The second option is to purchase several triangle reflectors. These collapsible units unfold into a triangular-shaped stand and will reflect light from any vehicles traveling in your lane. Another piece of gear often overlooked is a lug wrench. Although this item is typically included with most vehicles, it doesn’t get used a whole lot. If you’ve upgraded your wheels from the factory options, be sure and check the on-board lug wrench to make sure it fits the new lug nuts. A difference in size means it either won’t fit or will simply spin, rounding off your lug nuts in the process. Without this item, or a comparable sized wrench, there’s no way to easily remove a wheel in the event of a flat. If your stock wrench no longer fits, hit up your local auto parts store for one that does. A popular option for a lot of off-roaders is known as an “X-wrench” or 4-way lug wrench. It’s a lug wrench designed with four different sized heads on each end. Some of the models are even collapsible, making them easier to stow away. Speaking of flat tires, two items come to mind. The first is a product that goes by various names, from run-flat to fix-a-flat and others. But all of these products are designed with the same purpose in mind. They allow a vehicle to travel short distances on a punctured tire without fear of damaging the rim or the vehicle. I’ve never personally used any of these products but I’ve heard they can be quite useful if you don’t happen to carry a spare somewhere on the vehicle. In more dire circumstances where the damage is more extensive, a tire repair kit can come in quite handy. My Powertank setup came with a free ARB Tire Puncture Repair Kit. The kit seems quite complete from what I can tell. I have to be honest though, I’ve never actually used one of these kits before so I can’t really verify how effective this type of kit is in a real-world situation. But it does lend some additional peace of mind in the event that I ever experience punctures to more than one tire simultaneously. If you do happen to find yourself saddled with a flat tire and don’t have the luxury of a CO2 tank on board, a good backup is to purchase a small, portable, 12v air compressor. Even with the CO2 on board, I still carry one of these because I never know when I might run low on CO2. It’s a relatively inexpensive item and can make a world of difference in the event of a flat. Even with a repair kit, your tire will most likely still be too flat to drive on safely. A compressor can also be used to inflate various pieces of camping equipment without wasting precious CO2. So this is another good piece of equipment to have on board. For the more remote areas, it’s oftentimes quite handy to have a variety of methods for securing equipment in place. This would include everything from tape, velcro, straps and twine, to larger gauge rope and carabiners. There are a number of circumstances where these items play a key role. Securing a tent or tarpaulin, hanging items to dry, binding items for easier storage or last-minute equipment repairs are just a few of the possible uses. For my needs I purchased a full-sized roll of rigger’s tape (also known as duct tape), 100 feet of parachute cord, 50 feet of 1/2″ diameter rope, several aluminum carabiners and a variety of velcro strips from Army Surplus World. There’s no perfect number or size for these items but having a basic selection of each on board means I am a little more prepared. As a general rule, it’s also a good idea to carry a set of basic tools with you as well. Again, there’s no perfect combination of tools that will handle every situation, but by throwing together a small selection of tools like wrenches, screw drivers, hammer, pry bar, etc, you stand a better chance of helping yourself out of a tight situation. A great tool to add to this selection is what’s known as a universal or multi-purpose tool. One of the most popular manufacturers is Leatherman, a company that currently offers a wide selection of universal type tools. The Leatherman Wave is probably their best seller and for good reason. As a combo device, it combines a lot of the basic tools that would be required not only for minor vehicle repairs, but could prove very useful in survival situations as well. If you don’t want to spend the money on a universal tool, then I suggest at least investing in a good knife. This can be handy for a lot of situations and like a universal tool, might make a world of difference in more desperate survival scenarios. I picked up a Gerber 4″ fold-away model awhile back just for this reason. Though it often gets overlooked, food and water are two very crucial items to have on board in the event of an emergency. It’s difficult to picture ourselves in a situation so desperate that we would require rations, but if you’re planning on an extended trip of any sort, this should be one of your first priorities. Lack of food is unlikely to kill you, but dehydration can very easily lead to dangerous complications and even death. So even if you don’t feel the need to pack extensive food supplies, make sure you have plenty of water on board or are near to a potable water source during your travels. The last items on my list of safety gear deal more specifically with winter weather conditions. If you are traveling during winter months where there’s a possibility of below freezing conditions, I highly recommend stowing an extra set of warm clothes on board. Extra gloves, hats, and coats could prove to be the difference between a successful venture and the more morbid alternative: death by hypothermia. Okay, that’s a bit extreme perhaps, but there is definite potential for this type of outcome in colder climates. Having a blanket or two in the vehicle can also help out quite a bit in these situations. Carrying extra de-icer for the windshield as well as an ice scraper means better visibility during winter weather. Lastly, carrying a small tarp can be quite useful not only in winter weather but any of the seasons. Tarps are typically water-proof and can be used to separate us from the ground elements, or shield us from inclement weather such as rain, snow or hail. In a dire emergency, a water-proof tarp can even be used to gather rain water for drinking. I think that about rounds out my list for now. I’m going to publish this to get the basic information out there, but I hope to add purchase links later on, for many of the aforementioned products to assist anyone who may be looking to put together their own set of safety gear. Though it may not suit everyone’s purchase needs, I was quite surprised to find that many of the items I required were available through Amazon. So if you’re looking to do a quick check on price or availability, I recommend trying there first. That’s not to say that Amazon is the best or only place to purchase these items. It’s just a great place to start. 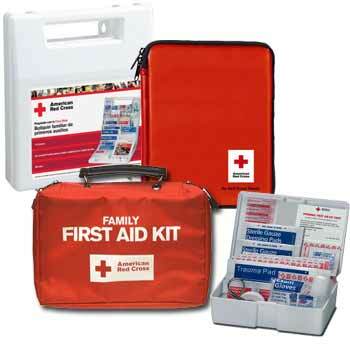 Many of the items listed in the first-aid kit, for example, can also be found at your local drug store. I’d like to close by stating that depending on the particular travel conditions, the above list may prove to be severely inadequate. For other situations, carrying all of the above items may be considered terribly overkill. I just wanted to cover a variety of items that you might want to consider in the event that you plan to travel. My recommendations are based on my research and my own experiences. The final selection is really up to your own personal preference.